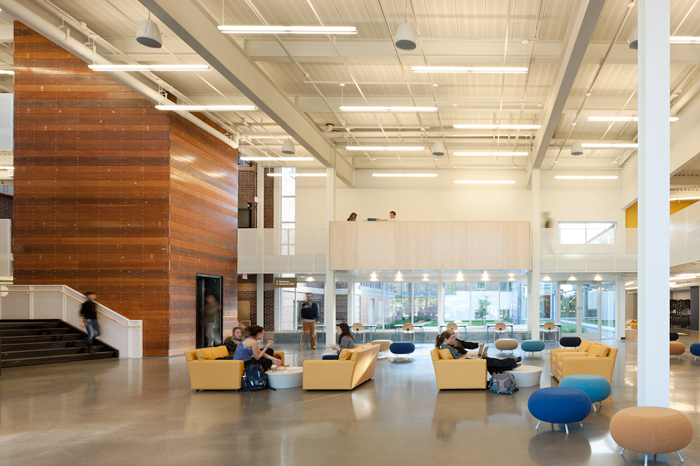 A renovated middle school building plus 30,000 square feet of newly constructed space make up the Carleton College Weitz Center for Creativity. The project is a complete reuse of the original 1910 building, with most of its historical features preserved. The re-purposed space retains the building’s grand high ceilings, old woodwork and doors, and original slate chalkboards. Some of the transformations within the space include a 1934 auditorium remade into a cinema, a library that now functions as lecture and small performance spaces, and a 1954 gymnasium redesigned as a performance theater. 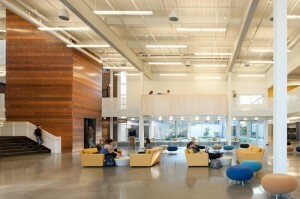 Throughout the renovated space, wood floors were strengthened to support new uses. Demolition of less salvageable spaces made room for a two-story museum and clerestory atrium structure (designed to accommodate a future third-floor dance studio) and a new three-story-plus-basement classroom building. Structural systems in newly constructed areas consist of structural steel and concrete plank on steel deck. Prior to design, MBJ performed a study to determine structural integrity of floors and roofs and the feasibility of creating a new stair/elevator atrium as well as the removal of the theater balcony and its associated structural consequences. The project is designed to meet LEED Gold certification criteria.